The Standard Services Agreement Template can be used by parties when they are hiring or exchanging any kind of services between each other. The Buyer and the Service Provider both have to sign the agreement and properly modify the Terms and Conditions, Service Description and any additional clauses if required. This agreement is usually used by Freelancers when they provide services online or locally. A detailed description of the services that will be provided by the service provider to the buyer as per the terms and conditions of this agreement. The start date, completion date and any other key dates to the term of this agreement and their details. The location of the site where the services have to be provided by the service provider. The payment that will be given to the service provider as consideration for the services provided by him/her. This the buyer will not include payment for out-of-pocket expenses. The service provider will have two provided with the buyer with an invoice for the said services and its subsequent payment, the service providers also has to mention the method of payment i.e. a cheque sent to a specified address or a wire transfer or a credit card payment. The next section contains the general terms of this agreement that is the intellectual property rights will be granted to the buyer of the services provided by the service provider, the service provider will have to warrant that he/she will perform the services with reasonable care and skill and that the services and materials provided by the service provider to the buyer will not infringe or violate any intellectual property. The term of this agreement shall begin on the date that it is being signed on and it will continue until the completion date unless it is terminated by either party. Either of these two parties can terminate this agreement after providing notice in writing if any part B is in breach of any obligation of this agreement or if both parties voluntarily decide terminate this agreement. Both the parties have agreed to a confidentiality clause stating that they will not use , copy, adapt, or alter, any information received from each of the. 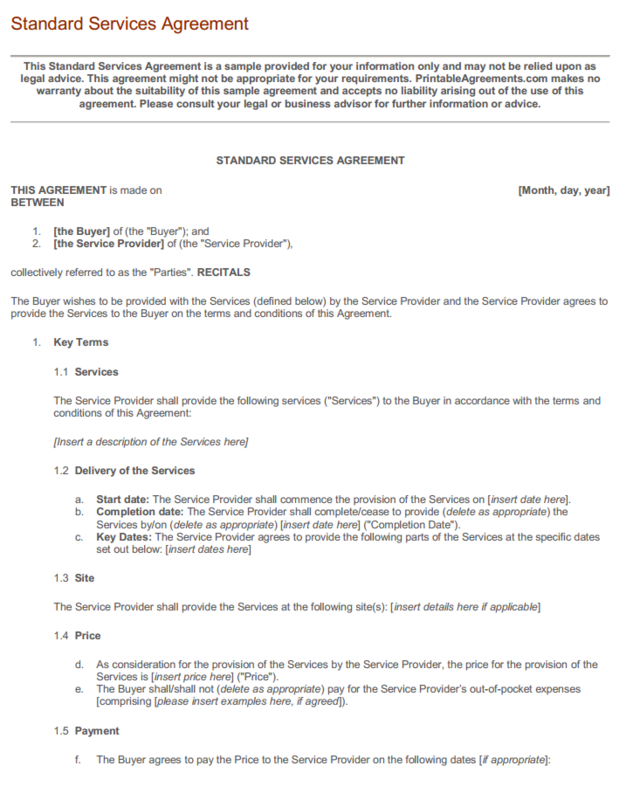 The rest of the document contains the miscellaneous terms and conditions for this standard services agreement. Download this template by clicking on the download link at the bottom of this page.